Meters are read monthly according to the billing cycle in which the account is located. Bills are rendered monthly and shall be paid at the office of CCED, by U.S. Postal Service, Bank Draft, or online at www.ccelectric.org. Final bills are rendered within approximately five (5) days of the meter removal date. Failure to receive a bill will not release a customer from the payment obligation. The net payment period is a minimum of fifteen (15) days between the bill date and due date. Payments are posted to customer accounts on the date in which the payment is received by CCED. Bills not paid by the due date will be assessed a 5% late charge on the remaining unpaid balance up to $250.00, plus a 1% late charge on the remaining unpaid balance in excess of $250.00. 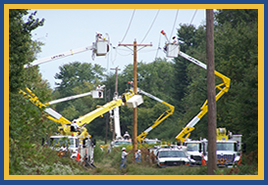 If you dispute the amount or correctness of your bill you may go to the office of the Carroll County Electrical Department at 103 W. Paris St., Huntingdon, TN or call the office at (731) 986-8284 between the hours of 8:00 A.M. and 5:00 P.M., Monday through Friday, except holidays, before the date for disconnection of electric service and one of our customer service personnel will assist you with your bill.